Depending on your requirements a planting plan can be drawn up as part of the garden design or in isolation where a complete re-design is not needed. 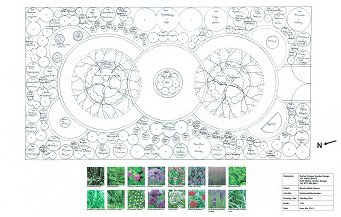 This plan will show you the exact location of each plant and its full botanical name. A plant list will also be provided giving you details of all plants to be used in the new scheme, the quantities and recommended sizes. If desired, we would be delighted to supply and plant up the plan for you. Our plants are all sourced from reputable wholesale nurseries whose quality is assured providing you with the finest quality plants at reasonable prices. More mature specimen plants can be provided for a more instant effect. However, this is not only more expensive but plants establish quicker if planted when smaller. You should allow 3-5 years for your newly planted garden to reach maturity.